This thrift haul is all shoes! They are not from one trip but most are from the last month. Some are from thrift stores and some are from estate sales. Most were under $10. I wasn't always a fan of thrift store shoes. I thought it was kind of gross. The shoe section of a thrift store isn't exactly pleasant. Shoes can be smelly especially when there are hundreds of pairs together. After a while, I dove in but only bought shoes that I could put an insole in or wear socks with then I thought to myself. "You can clean them, ya know?" Now it's one of the first stops I make when thrifting. Shoe funk and all! I've found some real gems over the years. Sneakers because they lose their effectiveness as a running shoe, trainer, etc. or so I've heard. I am not the least bit athletic. I can't say for sure. Unless they look brand new they're probably not worth it. Fur or fleece lined boots like Uggs because I can't see the inside and critters could hide in the nap. Probably no critters but not taking a chance and professionally cleaning would be too expensive. I almost broke a couple of weekends ago on a pair of vintage fleece lined Bass that looked super cozy and comfortable. They didn't have much wear on them. 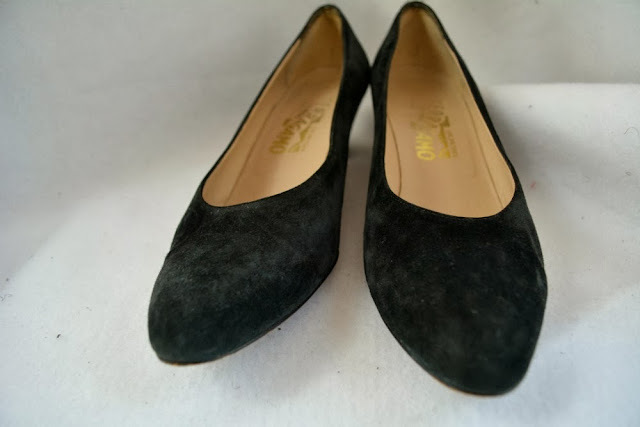 They were also suede which is a special cleaning too. No deal. 1. Use nail polish remover to remove the marker price sometimes written on sole of shoe. 2. For non-leather shoes*, wipe down shoe with a damp cloth (inside and out) in a mixture of vodka water or vinegar water. Please don't use your good vodka to clean shoes. Pick up the cheapest brand you can find or use vinegar water. I use a 50/50 mix. 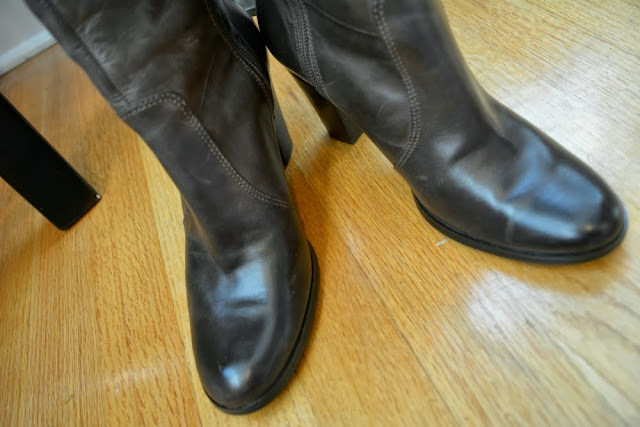 For leather shoes, I rub in some saddle soap and then rinse with the vodka water. *do not attempt on suede. You will need a special cleaner for suede shoes. 3. Spray lightly with disinfectant spray. 4. Let shoes dry near a window or outside to soak of ultraviolet rays that kill bacteria. If you happen to luck up on a really expensive shoe, invest in a good shoe shine, buff, and heel cap replacement at your local shoe repair. 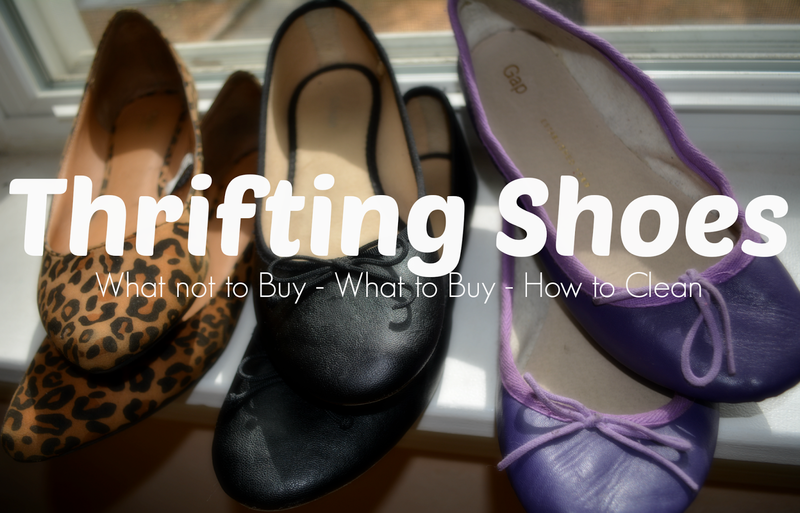 Do you wear thrift store shoes? What cleaning tips do you have? I shop shoes at thrift and consignment stores. I do stay away from sneakers too. I've invested in some shoe cleaners from stores like Foot Locker and other local shoe stores in our area to make sure I get them squeaky clean. Yes, I use ammonia and water, bleach and water and then spray with disinfectant. You can also put them in the dryer. My local Goodwill has tons of the buy out shoes from Target all the time so they are new with tags. 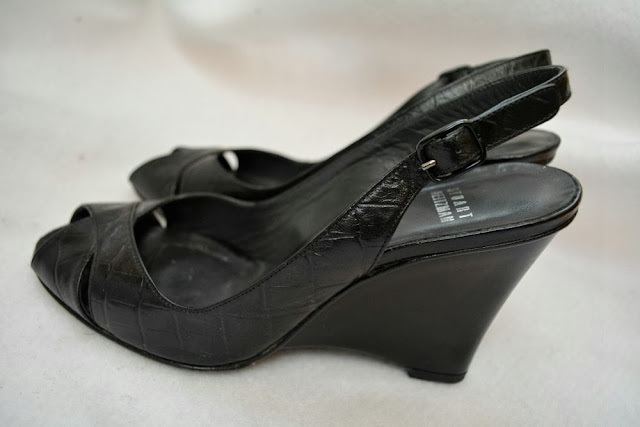 I did find some awesome Stuart Weitzman pointy toe heels but they were a 7. :( Too small for me! I always use those sanitizing wipes (the kind without bleach) and then a foot bacteria killing spray from Walgreens. The kind you use for athlete's foot? 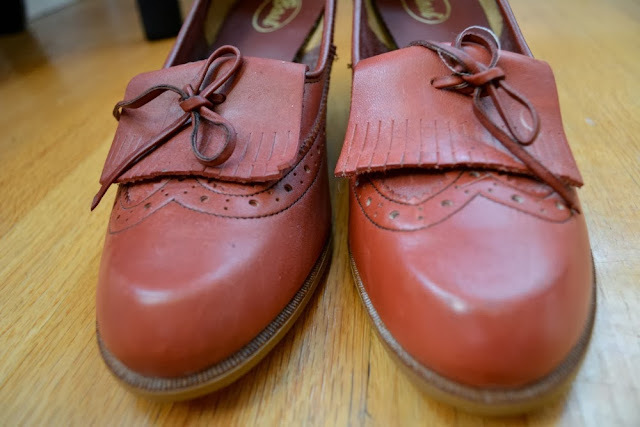 It's perfect for thrift store shoes! 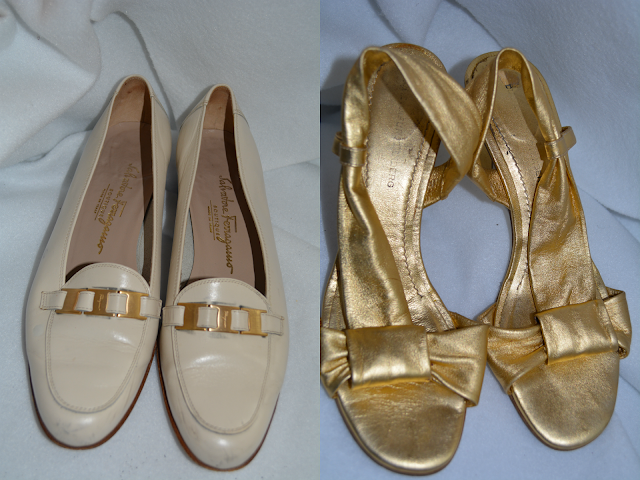 I love thrifting for shoes but I hate that most thrift stores don't put the size on the shoe. I pray for a day when universal round tags with the size go on the shoes so Size 10 N gals like me don't have to hunt. The vinegar water was a great tip! The dryer? Do you put it inside of something. That would be a great solution for my critter fear in napped boots. Good tips! I think I will get some of that foot powder. That will certainly drive the price up! I see my next business venture! "Please don't use your good vodka!" I spit out my milk! Love this post btw. I never bought shoes either but I like these tips. 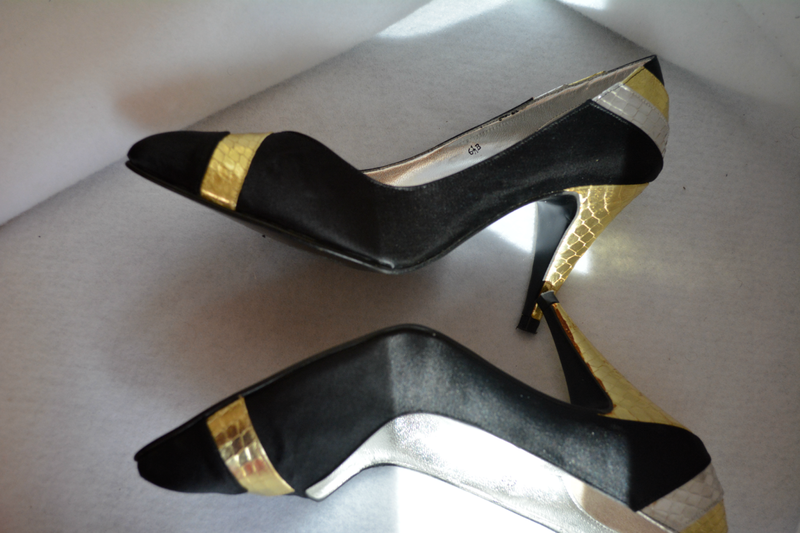 I wanted to once, they were Chanel and on consignment but I just couldn't.